230 Volt Kit includes the M.BL-2CE Bench Lathe with A-TM-5 and A-TM-6 Tapered Spindles, A-CHA-5 Collet Holder with 3/32", 1/8", and 1/4" collets and A-WM-6 Wheel Mandrel. The M.BL Bench Lathe has a high torque, permanent magnet motor that is extremely quiet and smooth running. Cast iron base has mounting holes and suction cup feet for a secure hold on the work surface. One Year Limited Warranty. 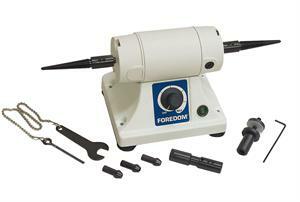 Click the button below to add the Foredom Bench Lathe Kit, 230 Volt to your wish list.